KS: So, Eriogonum corymbosum, or Crispleaf Buckwheat- what would you like me to call you? KS: Could you introduce Eriogonums in general to readers who may not know about them? KS: Yeah, let me put up a photo for viewes. EC: Ah, wonderful. Oh, look at him in the snow. Nice. KS: Indeed, that is actually why I'm interviewing you now out of season- because of what you are doing now, but before that, can you comment on your general work and past summer projects? KS: Congratulations- yeah, I think I saw you there. (Here's a shot for readers). You were quite orange, my favourite. And you did that with an incredibly nasty bentonite slope to work with. -Just an absolutely fabulous desert garden that really does deserve more attention. My thanks to Don Campbell and his crew for putting us all together for that spectacular exhibit. Can you put up a general slide of that one for folks? The Joshua tree, aka Yucca brevifolia, suprises everyone. EC: Oh, yes, and there I am between the Chollas. This is where my warmer, softer character works as a good foil to their strong personalities. Plus: white and red, I have always thought, are very classy. But I am also at Chelsea Nursery (one of my best producers- thank you guys so much!). Yes, here you can see me with the Blue Avena Grass backing up this wonderfully rusty chair. see, it's that kind of aesthetic I am good with. Some folks just don't see it. If everything isn't a background of turf-green, or they don't see bright pink and other pop junk they are used to, they find it easy to completely overlook our art, but we are working on that. KS: Right, so just what do you fancy is in store for your future? 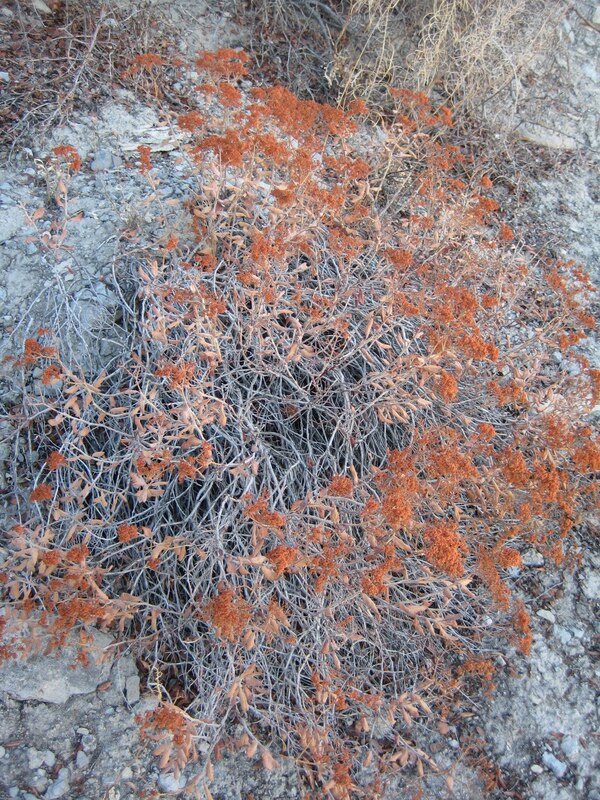 EC: Well, I think that the Eriogonum Society betrays that there is a growing interest and growing work on our genus by very capable people- so I am hoping that I will get the attention to be improved to the point that I'd be useful and ready to be cast in the cutting edge of dry-land gardening, because it is work I know well and I think I present some significant contributions- we've got to connect the good actors with the public, but we have to educate them to make that transition happen. Yeah, I think that in time I could be more of a household name, at least among gardeners, but all that depends on the success of the dry and native garden movements as a whole. Some two-hundred seed pots under lights this winter keep me out of one trouble and into others. The number of proper winter days we've seen so far in Denver are countable on one human hand. The rest have been warm and most of them sunny. I am growing veg in pots that come off the balcony and indoors overnight (but I am recently questioning if bringing them in is even necessary most of the time.) The veg seedlings are officially one month old now- they have grown considerably in the few days between to-day and the above picture. Oxalis versicolor (growing in Timberline Nursery) makes a super kitchen-windowsill denizen (because its flowers will look out the window, turning their backs to you while you, who is washing your dishes and inexplicably find yourself craving a candy cane. But some things are properly beautiful being alseep right now. Galanthus elwesii has been the best performer of three or so species I've tried in the general long run for gardens. It is bigger, earlier, and prettier, ( in my opinion) than G. nivalis (common) or G. ikariae at my old garden in Grand Junction. Also more rugged to mistreatment. I have found that one of the several better patches of it try to bloom in the middle of winter rather than at the end, and this is one of those. The day after the photo, snow finalyl came to Colorado lowlands, and stayed. Bird's Eye view of part of my first garden. Now that it has had a few years to settle in and fill in, I feel it is time to rip up a part of it whose design I've never liked. I'm so fickle. Just enjoy the different colours in the winter. Bergenia cordata hybrid. It always signs up for bold evergreen burgundy presence. A commonly available plant that ought to be thought of more for that characteristic. My Oregon grape gets me all New-Year Sentimental: This is what the Mahonia (before you get too attached to calling them Oregon Grape) in Southern India's high mountains are doing in winter; photo taken almost exactly a year ago. Mahonia nepalensis. If it weren't for simple plants like these, I would be tempted to go indoors, go into a nice little clinical depression, and write off the idea of being outdoors when winter comes in earnest. Fancy that.